Common cold refers of the viral infection, infecting the upper respiratory tract. You will be surprised to know that it is the world’s most common disease. In a technical or medical term it refers to the inflammation of the upper respiratory tract. The disease last for about 3 to 10 days depending upon the immunity of an individual. Every age group is susceptible to its infection but it is more commonly prevail in school going children. 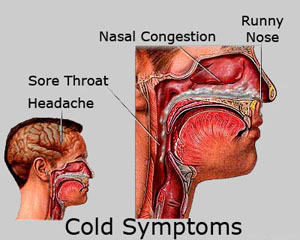 Generally nostrils are the most involved body part but other parts like bronchial tubes, ears and sinuses can also get affected depending upon the rigorortiy of the infectious condition.The common cold generally involves a runny nose, nasal congestion, and sneezing. You may also have a sore throat, cough, headache, or other symptoms. Colds are the most common reason that children miss school and parents miss work. Parents often get colds from their children.Children typically get up to eight colds every year. They usually get them from other children. A cold can spread quickly through schools or daycares.Colds can occur at any time of the year, but they are most common in the winter or rainy seasons.A cold virus spreads through tiny, air droplets that are released when the sick person sneezes, coughs, or blows their nose. A person with a cold sneezes, coughs, or blows their nose near your. You touch your nose, eyes, or mouth after you have touched something contamined by the virus, such as a toy or doorknob. Cold symptoms usually occur within 2 or 3 days after you came in contact with the virus, although it could take up to a week. Symptoms mostly affect the nose. Always wash your hands: Children and adults should wash hands after nose-wiping, diapering, and using the bathroom, and before eating and preparing food. Disinfect: Clean commonly touched surfaces (such as sink handles, door knobs, and sleeping mats) with an EPA-approved disinfectant. Choose smaller daycare classes: Attending a day care where there are six or fewer children dramatically reduces the spread of germs. Use instant hand sanitizers: These products use alcohol to destroy germs. They are an antiseptic, not an antibiotic, so resistance can't develop. A little dab will kill 99.99% of germs without any water or towels. Vitamin C deficiency can often cause Cold problems. So go for rich natural source of vitamin C like Oranges, Gooseberries (Amla), Sweet lime (Mosambi),Grapes, Guava (Amrud) etc. Avoid secondhand smoke: Keep as far away from secondhand smoke as possible. It is responsible for many health problems, including colds. Avoid unne cessary antibiotics: Using antibiotics too often leads to antibiotic resistance. The more you use antibiotics, the more likely the medicines may not work as well for you in the future. That means, you have a higher chance of getting sick with longer, more stubborn infections. Breastfeed: Breast milk is known to protect against respiratory tract infections in children, even years after you stop breastfeeding. Kids who are not breastfeed get about five times more ear infections than those who are. Drink water: Fluids help your immune system work properly. Eat yogurt: Certain yogurst contains "active cultures," or beneficial bacteria that helps prevent colds. Get enough sleep: Not getting enough sleep makes you more likely to get sick. intake of hot vegetable soup. avoid foods like rice ,curd, juice, cold drink, ice reme. hot chicken soup , hot n sour soop are effective for cold home remedies 1 tea spoon adrak (ginger) juice with honey or sonth with honey . 2 turmeric with honey or milk 3 kali mirch with badam. peepal churan with honey twice a day. garlic is very useful in treating cold.add a spoon of arlic paste ta a glass of warm milk.it reduce chest congestion.improves breathing. boil cinamon in a glass of water with a pinch of pepper and honey,this will reduce throat prob and prevents cold from becoming chronic . Eating hot Gram flour halva helps in controlling running nose instantly and effectively. (Roast Gram flour with Ghee (Besan) till it changes to light brown color, Then add water and Sugar and cook for few minutes). Eating a small piece of Onion (pea size) or sucking a piece of Clove (Laung) helps to get instant relief from cold or running nose. Ragi mixed with Turmeric powder sprinkled on the burning coal and the fumes inhaled cures nose blockage or cold very fast. 10. Turmeric powder sprinkled on the burning coal and fumes inhaled (but after that don't drink water for 5 hours) cures nose blockage, cold very fast. Boiling Long pepper (pipple) in the Milk with Sugar candy (Mishri) and drinking this milk helps in curing running nose or cold. milk boiled with Ginger, Black pepper (kali Mirch), Basil (Tulsi) leaves, Cloves (Laung), Red Sugar candy (Mishri) or Jaggery is very useful in curing Cold. This should be taken hot before going to bed, and cover the body to reserve body heat, for few days. Taking Steam with Eucalyptus oil drops helps in curing cold or nose blockage. Black pepper powder, Ginger juice and Basil juice mixed with Honey taken thrice a day cures running nose or cold. Making Tea with few Mint (pudina) leaves or with Ginger or with Basil leaves and drinking cures running nose or cold. Figs (Anjeer) Boiled in water and this hot water taken twice a day cures cold or running nose. Taking Garlic in any form helps in curing running nose, sneeze or cold. Betel leaf with a Clove can be taken to cure running nose or cold. Eating half spoon of Turmeric powder and drinking hot water for few days helps to overcome running nose or cold. 20. Smelling Asafoetida (Hing) helps to reduce cold or running nose. Tamarind (Imli) leaves boiled in water for few minutes and filtered. Taking this decoction also cures sold or running nose. 22. Applying Castor oil (Erand Ka teil) on the center of the head helps in curing running nose due to excessive heat in the body. Drinking a spoon of Carom Leaf (Ajwain) Juice mixed with honey helps to cure cold or running nose especially in children. Nut Meg (joy phal) paste with honey taken helps to cure cold or running nose especially in children. Adding few drops of Doctors brandy in hot milk and given to children helps in curing cold or running nose. Mix a gram of dalchini powder with a teaspoon of honey to curb a cold. Prepare a cup of tea to which you should add ginger, clove, bay leaf and black pepper. This should be consumed twice a day. Reduce the intake as the cold disappears. Make soup from Tamarind pulp and take it to get relief from common cold.